I like your "Heels in the Wild" pictures! If ever I get a better phone, it would be nice to show some video's via You Tube maybe? I don't overdo anything, just enough to 'highlight' the interesting bits of the images. This one had someone standing next to her. Completely edited/coloured out. This one had the LOUD [distracting] branding removed from the bag. This one had a furry heel, redrawn to make it visible again. I think there must some interest in the photo's ....... the most viewed one so far, has 1230 hits to date. A few more images added, mostly using the old Nokia camera phone, and nearly all needing editing. Usual problem is getting verticals, vertical. Then adding corner detail to blank space created from the rotating operation. If only I had a phone with a gyroscope inside? Spent some time looking for camera phones and cameras today. In fact I bought a camcorder that takes 12mb stills which was an impulse buy ..... It may have to go back, as reviews suggest images can't be downloaded to a PC very easily. Just spent the two hours I was going to use on the Camden Part II write up, reading specs and reviews on circa 30 cameras. Seems there are two genres of camera I hadn't considered for this task, either one potentially better solutions than my original camera phone idea. I was completely unaware there is a style of camcorder called the pocket camcorder, that also does good quality photo's? I bought one from a major store while out yesterday, called a Sony Bloggie. As it turns out, it may have to be returned as the unit doesn't like downloading to a PC [the reviews claim.] It likes uploading to Facebook and You Tube [no desire to do either], but I do need to store images on my PC for further use. As it won't do this, or won't do it without some image quality problems, it may have to go back unopened. What the reviews did do, is open my eyes to the style of unit. There are a number of comparable systems for less, and more money. None of them perfect, but there is a range marketed by Vivitar [sold by Argos predominantly], that start at around £30. Yes, that's thirty pounds! The other genre, is the "tough" digital compact camera, usually offered to holiday-makers or sporty types needing water/dust/impact resistance while out and about in challenging circumstances. On a beach being the more common expectation. These are typically sealed units with no opportunity for externally protruding lens systems, so come with low magnification ranges as the lens has to work internally. Photo rather than video based, these are potentially ideal. The most exotic one I tried was a bank breaking £325. Very clever camera, one that I liked a lot because of its performance [image quality] and ease of setting up. Sony Xperia Ray. Great camera. No idea what the phone bit worked like. £180. Nokia C3 Touch. Good camera. Compact, not so good for web applications but easy to keep in a pocket - and discrete. £120. Plenty of research required for one or more purchasing decisions. Nokia 710 with Window O/S is looking promising at £140, for a new phone. Panasonic TA2 pocket camcorder at £80 was looking good, though the 5 mega-pixel stills from it, got a bad revue. Just got an HTC "Rezound" Android phone, not using the Palm Pre Plus any more. This one has earphones with Beats music, 16GB memory card, fairly expensive compared to some, but less than others. 8mp camera. I've had it for a week and am very happy with it. Very fast, stronger signal than with the Palm, many more apps available. It is big and heavy by comparison, though - 4.3" display. I'm not sure if >> this << is a perfect match, but the UK price makes disappointing reading. Specification reads well. Could be an ideal camera/phone for my needs. "Beats", and the WiFi helping to keep me amused while I rub down plasterwork and paint. Sounds like the same one. Every provider has a different name for the phones - mine is Verizon. It is 4G. It was $169 US - didn't see any $99 offers here, and I did re-sign for 2 years. No problem, as I have always used Verizon. By the way, it has a 2mp camera in the display for video conferencing - have not tried it. The regular camera seems to be as sharp as my large camera, but of course doesn't have the 15:1 zoom range! It was $169 US - didn't see any $99 offers here, and I did re-sign for 2 years. No problem, as I have always used Verizon. phonearena [.com] Note highlighted remarks regarding GSM network access. These announcements may not have transferred into a buyable product, if take-up was high on the more expensive deals though. Why discount if you don't have to? And looking at the spec of the phone, I couldn't see it being heavily discounted over here. It also looks like while the phone has fast 4G connectivity, the Rezound is not a GSM phone, which is the network protocol used here. ** Although I recently had to splash out on a laptop, I also wanted to upgrade the desktop computer. I noticed Intel socket 1156 four core processors were available for less money than the older socket 775 four cores, and decided I might put together a socket 1156 system. Ha! What did I know? So few socket 1156 boards around ..... The few new ones are high spec gaming boards, and used ones popular because like me, others had noticed the processors were cheap. There would have been a time I could have bought an ASRock board for £32, and could now, have doubled my money selling them on. I see the $99 offer expired Feb. 28th, and I got mine in May, so they really did increase the price. I am still happy with it. Haven't been away from a charger for a long time, so don't know about battery life. Haven't been away from a charger for a long time, so don't know about battery life. I don't believe I've read reviews on any handset, that didn't include complaints about battery life. I think it's the nature of the beast. Powering a 3 or 4 inch TV screen consumes power. Keeping automatic updates going 24/7, consumes power. Having wifi actively searching for a connection, consumes power..... How is a phone battery not going to suffer? The thing I miss about the Nokia I owned for a week, was being able to connect to the home hub and listen to internationally broadcast radio, for free on the handset. Rather oddly ...... Camera's are now encroaching on phone territory. I usually switch channels when adverts appear on TV. [Channel hop.] Recently, I 'got' an advert for a new Samsung camera with wifi. Take picture - email immediately! I'm never that desperate to share holiday snaps, but these have got to be great for reportage photography. Imagine, being able to transmit broadcast quality images of human interest stories, literally while they're happening. Impressive. Seems there's a camcorder in the range too. I have largely given up on a camera phone. Unless I spend a stupid amount of money, the ones I prefer are too much money. Looks like Christmas or just after, is the time to acquire one of these. Instead I'm in the market for a 'tough' camera, or better known as a waterproof camera. I've still been taking pictures with my grainy Nokia phone camera. Got a few stored, so I'll upload these soon. You will be pleased to hear that I have found an iphone app called silent camera, which does exactly what it says on the tin..... Ive had a couple of practise goes and quality is pretty good. My mobile network rang yesterday to offer me a 'piggy-back' deal on my contract for a 2nd and/or third person. An offer I suppose is tilted toward spouse/children. While the contract is for 24 months [downer] the minutes on offer are good, plus a whole lots more than the Pay-As-You-Go minutes available for the same money. [£10]. So the contract is looking attractive. Reviews of the phone are unusually good. Comes with an older OS, but the later version known as "Ice Cream Sandwich" is apparently in the pipeline for the phone. But for the fact it would cost me £200 to buy, I'd be tempted myself. 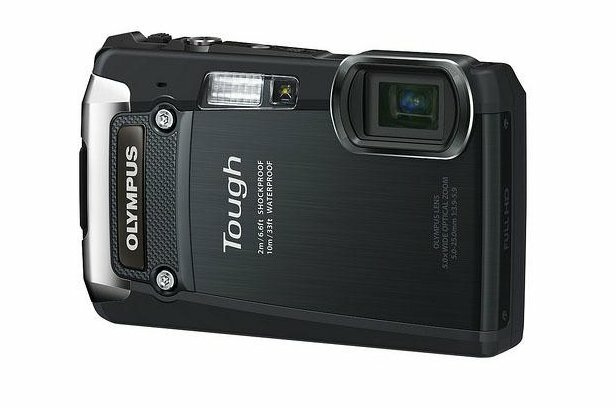 The Olympus Tough 820 has been reduced in price to £219-95. On paper at least, this is the camera that ticks all the boxes. Waterproof, so no extending lens. Works in low light [iSO 6400, though 3mb picture at that rating.] And if I buy at the right store. it comes with a 2 year warranty. Done deal? The price of the 820 has fluctuated a little, and my preferred seller currently has it at £229 delivered with a 2 year warranty included. As far as I can work out, the second year is only offered by them. Finally placed an order, with delivery expected tomorrow. I have 14 days to make up my mind whether to keep it. If it performs in low light, I'm sure I won't want to return it. I hope it can work in lower (shop and evening) light levels. Camera is here. Charged, with 8GB fast SD card. I is ready to rock and roll. Might be popping out to some TK Maxx stores today. A style of French Connection boots I bought (twice) and returned (twice) might have appeared in some of their stores. I'm not hopeful, but these are a style I seriously regret giving up. Didn't ever think I'd wear them out, but now know I would. Will be taking camera too, for a 'dry run'. Initial try with camera came with mixed results, some of which, was down to my aiming skills. Thirdly, the image size on the faster ISO settings is abysmal with only 3mb available. So not much better than my fairly inadequate phone camera. As some of the images are too large to include here, I'll have to upload them to another location. Having spent two hours editing them (and I have things to do) I'll have to upload them, and provide links, later on. I must have taken almost 200 photo's during the test. Initially I had no success because I had believed the camera was fast enough to 'freeze' motion, but I was wrong about this. I then tried to limit my activity to stationary subjects. Even this wasn't easy, because of my own hand movement. Blue dress 1 of 2. Blue dress 2 of 2. I think the subject matter speaks for itself? I also tried to use the camera's video option in what was quite a well lit area. [Refer to "Two girls walking".] When I say well lit, I mean well lit given the time of day; midnight. While trying a third or fourth attempt at videography, I got an interesting subject in the frame. As I can't edit or hide the identity of the people in the recording, I have taken some screen shots from the clip. The video seems to be better quality than the photo's, which I don't at this time, fully understand? So far, I'm impressed with my £230 purchase. So far, the camera has proved very difficult to use. The setup button [for all the camera settings] is sat on the rear of the camera where the inside of my palm grips the camera body. Consequently, when I grip the camera, I seem to keep pressing the 'setup' button. Maybe the camera was designed by a left-hander? Well, the snow came ...... and went. On balance, it is a great tool, and I got it at a great price. But it'll be quite a while until I would be in a position to do anything useful with it, so I'm going to keep the money in the bank for a bit longer. The unreleased GH3 may be available mid 2012, and maybe I'll get that. It's supposed to be even more sensitive in dark conditions, though a good deal more expensive too. While waiting for the GH3 to arrive, I've been searching for news most weeks. It seems Panasonic have done as expected, and waited until Photokina next week (18th Sept) to announce it. The camera seems like it will have all the features I would like, and some I'm not sure I would need. One of those features is broadcast quality video and sound..... The anticipated price is £1600/$2000 for the body and basic lens kit. As a once off purchase, I could buy, but something better will come alone in 2 years (or less), how would I feel about that? So I http://www.youtube.com/watch?v=xWt-2VfDr-o. Seems he dislikes the G3 for the same reasons I did. The G5 has improved in the critical areas, and his recommendation was very good. While the camera isn't available throughout the UK [unless grey imported], stock is on its way. [The other side of Photokina, probably]. This will be priced around the £800 mark for a similar basic kit to the one I bought last year. So similar money, but what for me would be a significantly better camera. I plan to keep the Olympus Tough 820. A bit pricey for a 'stand-by' take-anywhere-camera at £229 (Mrs Freddy has something quite similar for £50), but being black and configured not unlike a phone makes it very discreet. Especially since there's no lens popping out as with Mrs Freddy's camera. Be nice to have a 'proper' camera too. But can I live with having two quality cameras? Tried the Olympus Tough 820 during daylight with ISO set to 1600. Image quality is better, but many of the photo's posted here have been cropped. [ie. reduced in size to remove distracting/surrounding detail.] The cropping edit may suggest the image quality is lower than it was in the original, as the balance of the image size might well be less than a quarter of the starting size. Brightness levels were significantly higher, and freezing motion wasn't a problem. Having a chat with colleague. How it's done. (Smoke and mirrors.) Very attractive lady in tube skirt and stiletto heels. Attractive lady in OTK boots. Great outfit. So far, it comes highly recommended.